I love quick and easy meals because, let’s face it, sometimes you don’t have the time or the energy for complicated meals, yet you want to eat healthily. It is so easy to just have junk food because you have had a long day and it seems quicker, but it will not leave you feeling satisfied or energized. 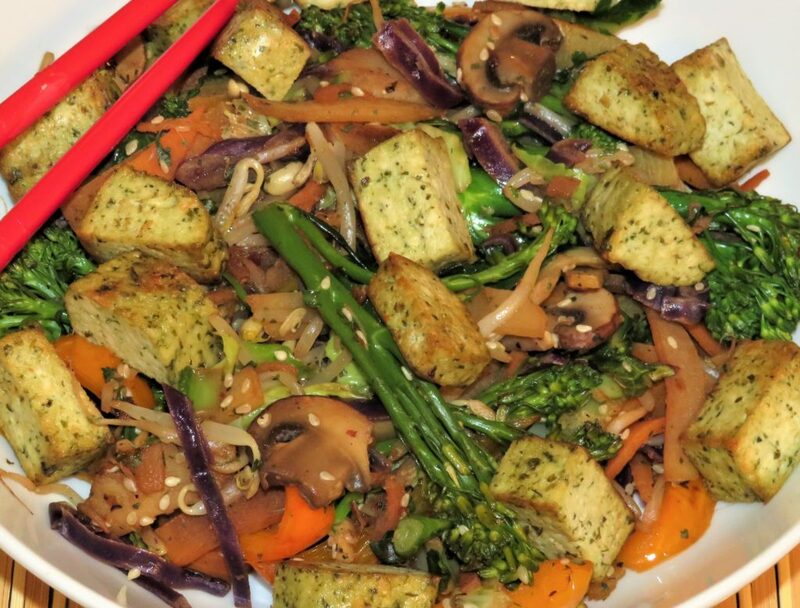 This stir fry is healthy, tasty and in 10 minutes you can be sat down eating. Perfect! 1 Heat the wok or a large pan on a high heat. When the pan is hot adding half the oil then add the tofu. Continually stir cook for 1-2 minutes until a light golden colour, then remove from the pan and put aside. 2 Add the remainder of the oil to the pan then add the garlic and ginger, stir immediately. Then add the peppers, tenderstem broccoli and mushrooms keep stirring, after 1 minute add the onions. 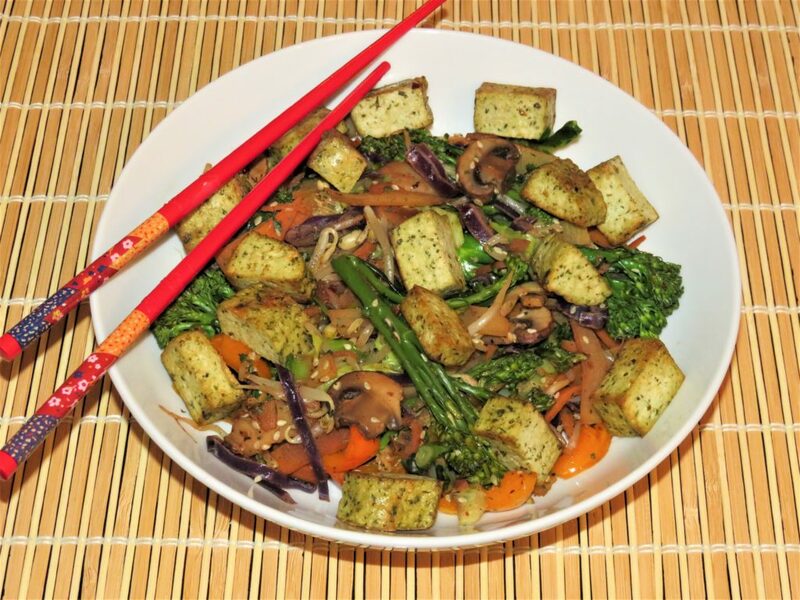 3 After 3 minutes of cooking, stirring continually, add the stir fry veg pack. Keep stirring and tossing the veg in the pan and cook for 3 minutes. Then add the tamari, cracked black pepper and chilli flakes, stir and cook for 1 minute, before adding the sesame seeds. 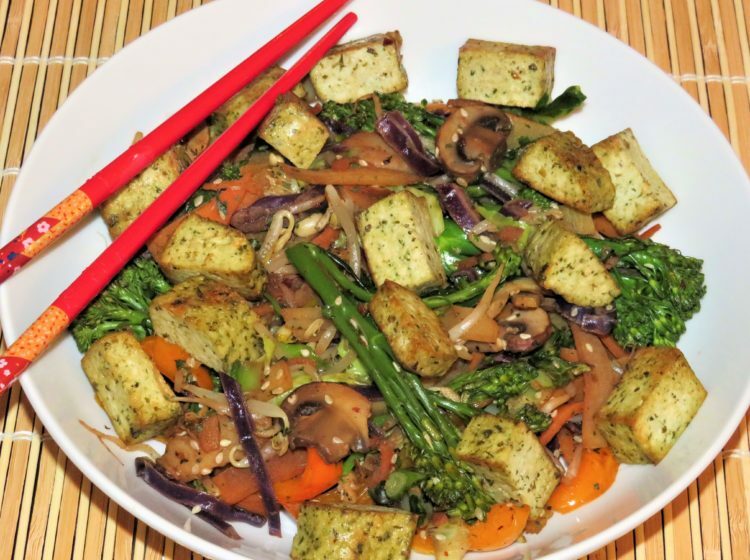 Mix and serve the veg in dish, placing the tofu on top. Enjoy! Tenderstem broccoli not only tastes better and cooks quicker, but it has a higher concentration of vitamin-C which is great for fighting cancer, vitamin-A, vitamin-K, calcium, fibre and contains more folic acid to standard broccoli. Rapeseed Oil Contains less saturated fat and 10 times more omega 3 than olive oil. It is a good source of vitamin-E, vitamin-K and high in monounsaturated fats and anti-oxidants.